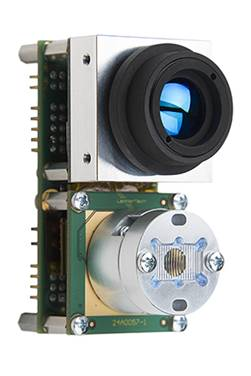 Compact 8-segment LiDAR sensor module leverages powerful class-1 laser illumination and 8 independent active detection elements into a single sensor, resulting in rapid, continuous and accurate detection and ranging of objects — including lateral discrimination — in the entire wide beam, without any moving parts. Detecting targets up to 215 m and weighting only 75 grams, the Vu8 uses a fixed laser light source, which significantly increases the sensor’s robustness and cost-efficiency compared to any scanning LiDAR solution. Vu8’s source assembly combines the IR Laser emitter with a dominant wavelength of 905 nm and diffractive optics, providing a wide illumination beam which is available in three horizontal (20°, 48° and 100°) and two vertical (0,3° and 3°) field of view options. The receiver assembly includes 8 independent detection elements with simultaneous multi-object measurement capabilities and hosts the powerful signal processing algorithms. Vu8’s carrier board hosts the electrical and communication interface of the module. Two interface configurations are available: SPI or USB-CAN-Serial (UART/RS-485). The module comes with the SDK, which provides a user-friendly application programming interface (API) with .Net and C libraries, complete with code examples. 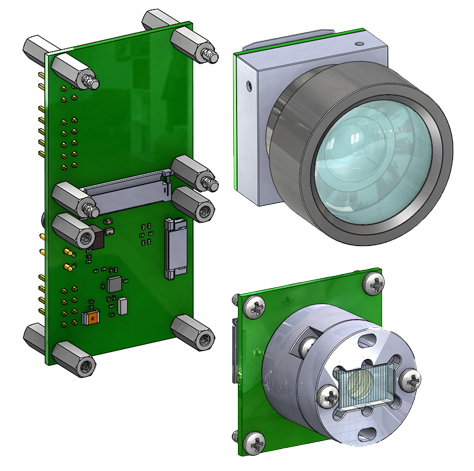 Sample code for RS-485/MODBUS for both Windows and Linux, as well as LabVIEW and MATLAB integration examples are also provided.